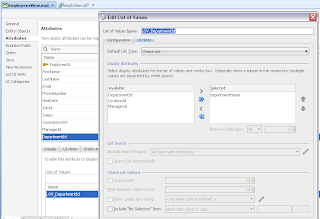 What if you face requirement, which tells to give default value for ADF query field in the search box. This is not just for some static value, but default search parameter must come from another LOV view object. As example in this post, I will implement use case where first value from LOV view object will be set as default value for the search field. When Bind Variable is assigned with default value, this allows to show this value in the LOV search field included into ADF query. Don't forget to register LOV VO instance in Application Module, otherwise custom method will fail to find it. 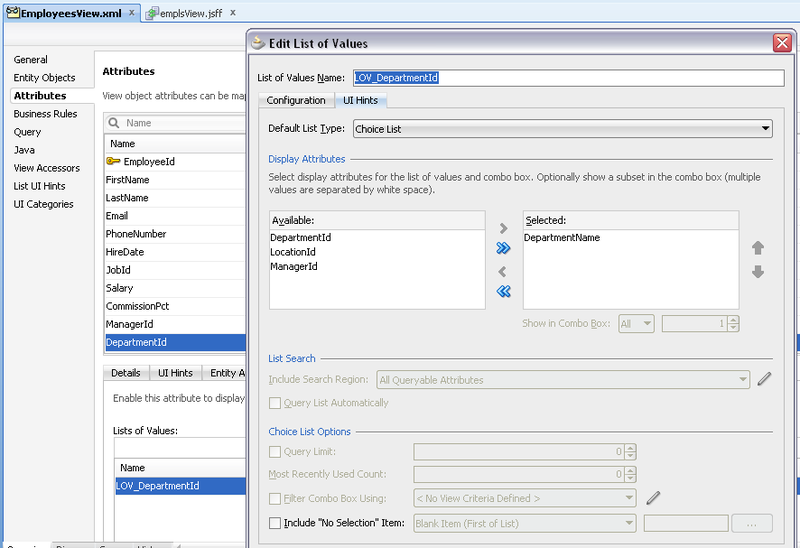 This instance will be used to retrieve default value for LOV rendered in ADF query search block. I do really need this implementation, putting a default selected value in the selectOneChoice in AF query component. But the problem is, the steps here are not applicable to JDev 11g Release 1(11.1.1.6.0). When I put the groovy expression as you told as default value for bind variable, it isn't accepted, causing error. Any work around on this? I also have to do similar implementation but I want to default and attribute from and attribute from another vo. I am not sure how shall I do that as I am very new to ADF. This implimentation works when we need to show the default value for LOV. But when I try to select a different value from the LOV, only the default value is getting saved as the attribute value, no matter what other values I choose.. This Should not be expected right? Can you please advise what am I doing wrong? 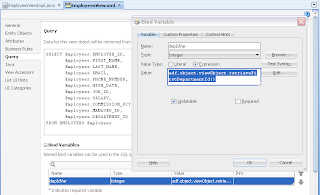 This post about ADF Query, we don't save value in ADF Query, but use it for search. I have been performing much trial and error with no success. My situation is as follows. 1. I have a search form (af:query) using a custom named criteria defined with multiple LOVs. For simplicity just assume one LOV for this custom named criteria. 2. 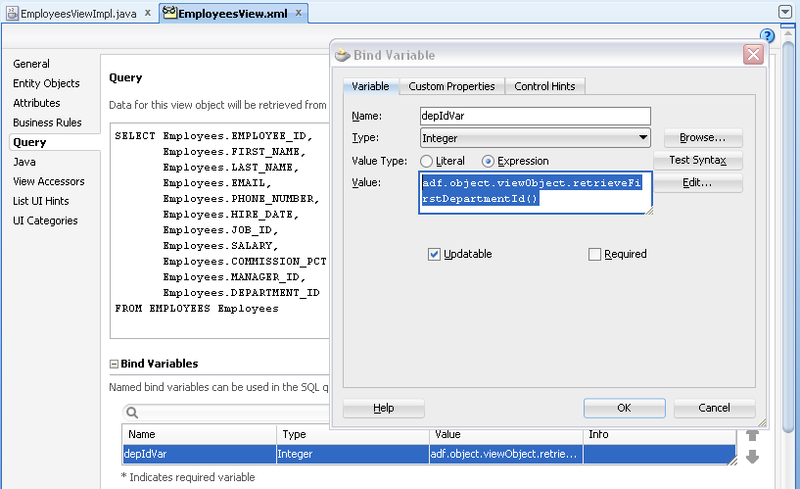 The LOV is defined as an SQL Query View with two fields, code and description. 3. I wish to display the code and the description in the search form. However I wish to keep them in sync with each other so if code is changed, then description is changed automatically and vice versa. 4. I also have the operators available so it is possible for the user to choose various operators. The intention of this search form is to be specific. It will disallow pattern matching by limiting the available operators to just those that take a specific value??? if possible. 5. How do I keep the two values in sync with each other and ensure that they are displaying in sync information immediately after the search button has completed the query? Can you please let me know hoe to achieve same requirement for date as dropdown? I am having a use case where I am using 'Input List of Values' component for providing option to choose from a list of values. My data control is giving me the values 'WWD','PPO','SDO','UXP'...etc. During the runtime, the 'Input List of Values' component is showing first value 'WWD' in the textbox with option(search icon) to choose other values. My requirement is to display blank value(empty) the text field and when user clicks on search icon, the popup box should allow user to choose from that list. Please suggest the needful. I have an scenario to set default value for Query based lov here I am sharing my scenario please give your valuable suggestions. by executing the above query it will display 2009,2010,2011,2012,2013,2014,2015,2016,2017,2018,2019,2020,2021 years. I drag and drop the queryvo as drop down in jsff page.